Cheap and easy organizing. Just the way I like it. Hey kids! How’s your January organizing going? I love January because it’s all about simplifying, organizing, and getting rid of stuff. I made a quick cheap organizational update to my bathroom vanity drawer and wanted to pass along the tip to you guys. Well, the day has finally arrived. I did find a new solution to this drawer drama, but it suprisingly wasn’t a “nice drawer organizer thing” and it wasn’t from IKEA or Walmart. 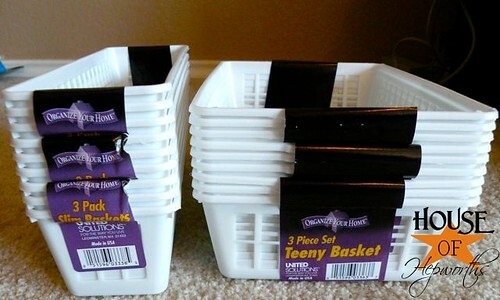 I found these little plastic baskets in 3-packs at the Dollar Spot at my favorite store in the whole world – Target. After a quick two-step shuffle I found an arrangement in my drawer where they all fit perfectly. And no, I did not pre-measure. I’m compulsive enough that when I see baskets at the Dollar Spot 3-for-a-dollar, I just buy them and *hope* I can find a good place to use them. I still can’t believe they all fit absolutely snug and perfect! 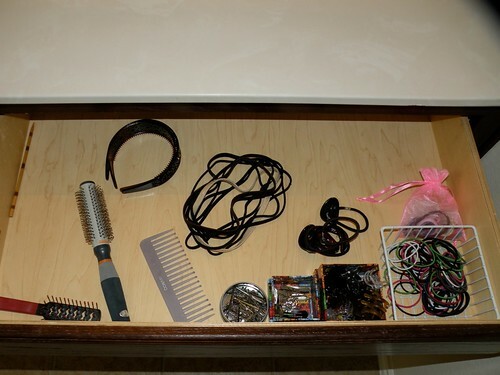 And I LOVE this drawer now. It stays so neat and orderly. Before, when I had the little mismatched boxes and such, they would slide all over the place. But now it’s like my drawer collided with The Container Store, but for only a few dollars instead of fifty. After about a month of living here I realized that having all the hair accessories and the kids toothbrushes upstairs in their bathroom was a total train wreck. Every morning before school it was “up the stairs, down the stairs, up the stairs, down the stairs, rinse and repeat.” So I moved all the hair accessories and dental hygiene downstairs. I’m so not use to living in a 2-story house. So the kids brush their teeth in our powder room and Kinsey gets her hair done every morning before school in my bathroom. It literally has shaved a good 10 minutes or more off our daily routine. And now I’m one step closer to having this house sorted and organized. We may have unpacked and had things put away after only a few weeks, but I tell you what, it takes MONTHS to feel like you are totally settled in your home and have everything in the perfect location. I’m still rearranging cabinets and rooms daily. Poor Ben and kids, they can never find the Tupperware, silverware, or mixing bowls. Someday. Hopefully soon. So, are you joining the majority of the rest of the world and decluttering and organizing this month? 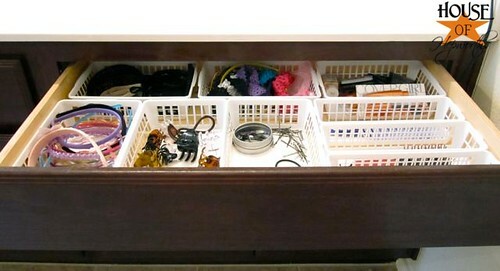 Do you have any cheap solutions for organizing drawers? Have you found any killer deals on good quality organizational equipment such as baskets, bins, drawer organizers, pockets, etc? If you’ve been an organizing fool this month and have a blog post to prove it, add a link to my comments section. We’d all love to come take a looksie! « Silhouettes with the Silhouette; plus a promotion! Doesn’t it just make ya Giddy like a school girl when things work out so perfectly? As a organization freak I find the look of that “after” simply devine! We’ve been in our house since July and I’m still trying to figure out the organizational stuff too. I have a feeling I’m getting a little closer! 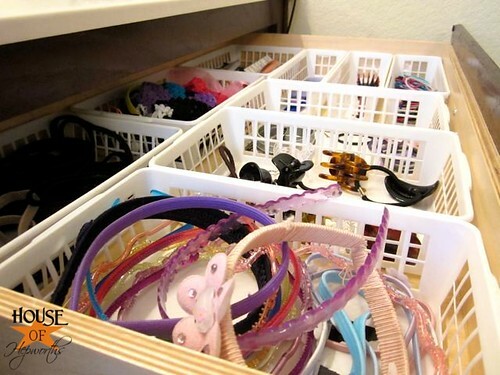 I LOVE organizing and those drawer bins are perfect!! PS: I agree, Target is the best place EVER!! Woo-hoo for organization! Yes, I’ve been organizing up a storm. So far we’ve tackled the junk drawers and the file cabinet. Trying to decide what’s next, perhaps I should take inspiration from you and head to the bathroom cabs! Love it! I found some of the same baskets at The Dollar Tree recently and did one of my kitchen drawers….I took a picture and plan to blog it but have been busy with crafts lately. And to answer your question, YES I am totally on the January decluttering bandwagon!! Those fit in your drawer perfectly! your organizing makes me giddy. alas, we are without Target here in Canada, although it was just announced last week they’re coming! …in 2013… I’m a patient person but…that’s a long time to wait! Love it! Thanks for posting. 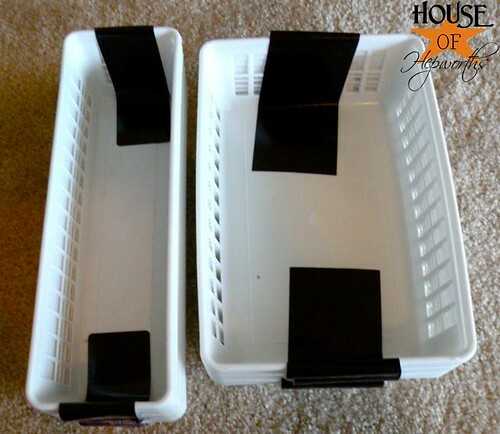 I just recently did an organization post as well using other bins I found, but was looking for these cheaper ones! I will have to run down to Target! I have been following the 21 day challenge at a Bowl full of lemons. It’s been great to get my organizing done although I am a bit behind. I totally know what you mean about those hectic mornings! Yep!! I am decluttering and organizing for sure this month. Still in process. Yesterday I organized and put away all the Christmas decorations. Score!!! Now on to the guest room!! Re-do is in order! Organizing like a crazy lady this month – doing the 21 day challenge from A Bowl Full of Lemons (link on my blog)…I am doing Spring cleaning NOW so I can play, come Spring! Love your drawer! Doesn’t it just make you so proud? Looks great! Letting go of tupperware that I paid for (some vintage from thriftstore and some newer etc) was a big step but it is like my cabinet is so happy and can breathe! Today in celebration we are making pudding – since I can find all the little containers and lids!! oooh, I just love those little white baskets!! I recently bought some and did a few drawers, etc. They are great! Congrats on your organization! You are now one step closer to having a totally organized house. Don’t you love it?! I’m addicted to having orderly cabinets and cupboards. I periodically go through the tupperware cabinet and toss anything that doesn’t have it’s mate. Also, this takes up more space, but I store all my containers with the lid on stacked up on top of each other. That way I’m not searching for the top to the container after I’ve already filled it. Plus, I don’t use a ton of plasticware, so I only keep maybe 8-10 containers at most. There’s just no point having 35 containers that I never use. You are rockin’ it! Keep up the good work!